I know..I’ve been neglecting this site a bit the last few weeks. I do have an excuse however : no rum or cachaça or whatever for the next couple of weeks…doctor’s order. Sop lease allow me to go and borrow some tasting notes elsewhere. 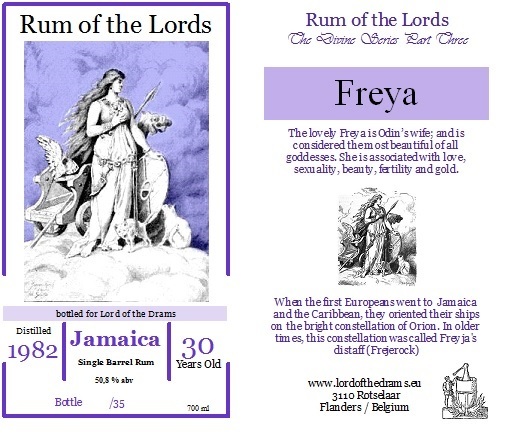 That gives me the opportunity to do a review on one of my favourite rums…but one I bottled myself; so it would be unfair to write my own tasting notes. Nose: Needs some time to open up. Succulent, on honey and heather wrapped in tealeafs and some leather. Apricots, vanilla and saffron. Even some thyme, nuts and oranges. Less oaky than expected. Great balance. Taste: oily mouthfeel, with the oak coming on louder now. Herbal somewhat drying touch, but sweet and juicy enough! Great fruity notes, with some banana. Aniseed and nutts again. Also some sweet coffee. Very beautiful! Finish: sweet and herbal, and very long. Intensive and not too dry. This is topshelf rum!